By 1955, Leon and his three brothers, all also musicians, had relocated to Los Angeles and were performing as The Four Scooters. Before long Leon was making connections with a who's who of the bustling L.A. blues scene, and over the next three decades played and recorded with some of the biggest names active on the west coast (and elsewhere), including B.B. King, Albert King (who says hired and fired him three different times), Roy Milton, Fats Washington, Little Joe Blue, and many others. Leon even played fill-in gig in L.A. with Chicago blues great Muddy Waters, when Muddy's regular pianist Pinetop Perkins missed his plane.When Pinetop finally arrived, Muddy didn't want to hire him back! All of this in addition to being a regular member of the Ike & Tina Turner Revue during their most successful years, from 1964 until 1978. Nowadays, still live and kicking, Leon mostly performs as a headliner either solo or with other musicians. Lately he spends quite some time in Holland. In 2011 this resulted to a very orginal recording during one session at Little Label, where Leon sat down at a beautiful baby grant and couldn't stop playing. 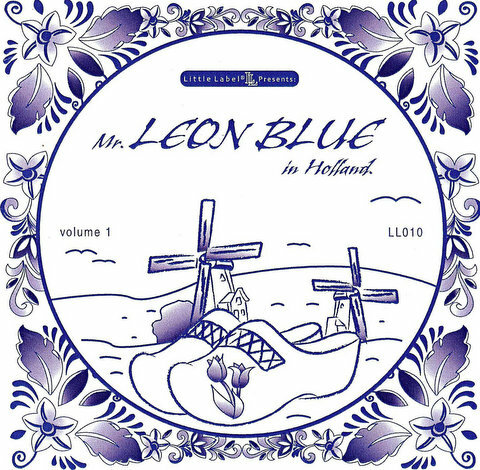 This cd, Leon Blue in Holland, is beautiful, emotional, original black blues. Legendary pianist Leon Blue! He thought the van was too crowded so he decided to ride with Paris Slim and I. So it was down the road to the Bainbridge Island Ferry. Leon Blue can tell some stories! He is a walking font of blues history. The entire way, I listened to him tell stories of legendary people he's performed with such as B.B. King, Albert Collins and Ike Turner. It was one of the most amazing discussions I've ever listened to! Perhaps sometime I can get him to tell his stories into a tape recorder for posterity!